Beautiful to look at and has the sweetest feel and sound of any driver I have owned in 40 years. It gets the ball up high and the 12 1/2 degrees of loft maximizes the gear effect. You can hit the ball way off the center line and watch in amazment as it curves back into the fairway. the gear effect is unreal. The sound and feel of a real persimmon club is the sweetest thing in golf. I am impressed by the workmanship and the quality of the wood grain and finish. I would not hesitate to buy this club again. Just a beautiful, traditional, yet modern work of art that plays as well as it looks. I get some real interesting comments on the tee from other golfers when I pull it out of my bag. After they handle it they want to know all about it. 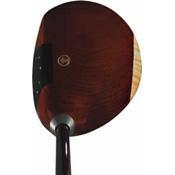 Most golfers don't seem to know that you can still get a custom persimmon club with modern design. I have several metal drivers, but I always go back to the Lousiville Golf driver. It just feels better and makes my game more fun. It is much more forgiving than any other driver I have tried. The best. All the Louisville Golf clubs are custom made and delivery is prompt. I also own three of their persimmon Niblicks also. They are fabulous fairways woods.